Fish finder is a good news itself to those fishers who are actually into fishing. Thus if you want one, you really have to take the hassle to go through many of the devices that are available in the market. Yet, in this situation, we can say nothing but HAKUNA MATATA, because we have come up with a Lowrance elite-5 ti review as it includes all the features that you look for in a device. It does not only feature Trackback option but some other cool things that we think you must know. And we hope that after going through the Lowrance elite-5 ti review, you will be able to decide that if you want this for yourself or leave it. However, let’s not delay anymore and talk about what this device has to offer and why should we love the finder. And we will help you with that! Welcome to our Lowrance Elite-7 TI review! Most fishers tend to have their favorite fishing spots. And discovering a new spot is the most exciting thing for them. But the problem starts with when you get back, there are high chances that you would forget where that great spot was! With elite-5 Ti, you can avoid this to happen without any hassle. Since the device has the Trackback feature, it will let you mark your favorite spot. Thus you can navigate back to them easily. Not only that, you can store up to 3000-waypoints with this device for its built-in GPS antenna. So it’s that much smarter than you think. Not only that, this is also one of the reasons that got us with Lowrance elite-5 ti review. The DownScan technology is all about delivering images of the bottom and structures underneath your boat. So, you can see a crisper image like photos to check out all the activities that are happening down there. Moreover, you can also detect vegetation, trees, boulders, wrecks and other waste with the device and it is able to create photograph-like 3D images of them. As for the Structure scan, it does not only provide detail of the underwater but also the sides of the boat giving a broader view of the area. Thus, you will find Elite-5 Ti very different as the two have been combined and the Chirp technology is added to the mix. lowrance elite-5 ti consists of a CHIRP sonar technology that works great for recognizing and differentiating the bait and game fish targets. Hence you will find it easier to target the fishes at much-heightened resolution. Thus, you can pick out in more detail to track out what exactly is beneath your vessel. While many of the fishers are using single frequency signal, here the Lowrance elite-5 ti is able to send multiple frequencies at the same time. Moreover, it lets you see more fish target with less clutter. 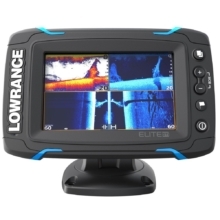 Lowrance Elite 5 ti has an LED-backlit color 5inch display with800 pixels wide by 480 pixels tall. You will find many fish finder who complains regarding the fish finder for not being able to read during the daytime. But with this device, the Lowrance boasts to assure that it can be seen in the daylight smoothly. However, you will find the display way small for accommodating the Full-Screen Chirp sonar and DownScan Imaging. And the poor graphics might upset you as well. But, its HDS Gen II touch system has made its way into these new devices, and it’s a good news for the fishers who are looking for the simplicity of touch plus side and down scanning sonar. DownScan can create photograph-like 3D images of anything that it finds beneath the boat. The multi-touch touchscreen offers fast fingertip access to all the features. The display is way too small and the graphic is poor. Poor packaging might destroy the product. Some of the parts like all the mounting bracket and hardware might not come with the product. Q: Do you have to purchase the charts separately? A: The basic charts are installed yet if you want detail you need to buy the Navionics maps supplies on a micro SD card. Q: Which specific transducer comes with the unit? A: The Elite Ti comes with a Lowrance TotalScan Skimmer Transom Mount Transducer 000-12568-001. It is an all in one transducer having CHIRP Sonar, DownScan Imaging, and StructureScan HD. Q: Can the totalscan transducer be mounted on a trolling motor? A: We would recommend you to not mounting totalscan transducer on a trolling motor if you think of using the sidescan features. It is because the sidescan images become confusing and incorrect when spinning the trolling motor accordingly. Q: Does this unit come with the recommended power cable? A: Yes it comes with the power cable which is 20 feet long. Q: Is the total scan transducer showing temperature? A: It will show the temperature but you need the additional sensor. From the Lowrance elite-5 ti review, you might have understood that the device comes with easy to use touchscreen and trackback option. So you can say that it is indeed one of the best fishfinders out there. Moreover, its crispy sharp images highlight the device for most, and the collections of the maps are also a highlighter. 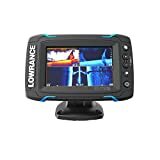 So, if you want a great fish finder, and if you think that the small display does not matter for finding your fish, then we would suggest you try this out definitely. We hope the device will not let you feel down.